It has a wide range of habitats, from rich tropical lowland and hill rainforest tropical mountain forest, sub-alpine forest. It has been nominated as a Centre of Plant diversity for Southeast Asia and is rich in species of flora from the Himalayas, China, Malaysia, Australia, as well as pan tropical flora. 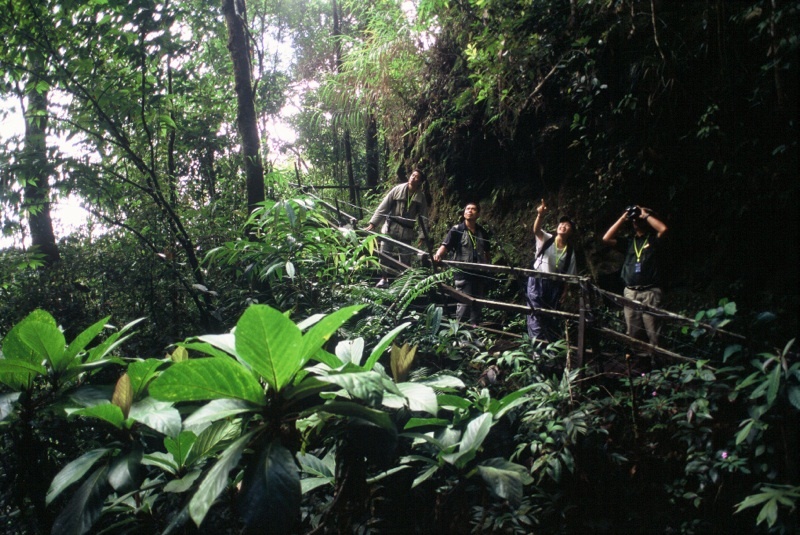 The park has around 5,000-6,000 vascular plant species, 1,000 of which are orchids. It is specially rich in Ficus, Ferns, Nepenthes. Rafflesia, is a rare parasitic plant is also found. The mountain flora has diverse “living fossils” such as the celery pine and the trig-oak, the evolutionary link between oaks and beeches. The variety of plant life is great habitat for variety of birds and animals. There are around 326 species of bird in the Kinabalu National Park, including the Rhinoceros Hornbill, Mountain Serpent- eagle, Dulit Frogmouth , Eyebrowed Jungle flycatcher, and Bareheaded Laughingthrush. It has also high majority of Borneo’s mammals, amphibians and invertebrates (many threatened and vulnerable) known to occur in the park.